The Hunters Point Rebellion, touched off Sept. 27, 1966, 45 years ago today, by the police murder of Matthew Johnson, 16, was put down after only 128 hours with massive force. 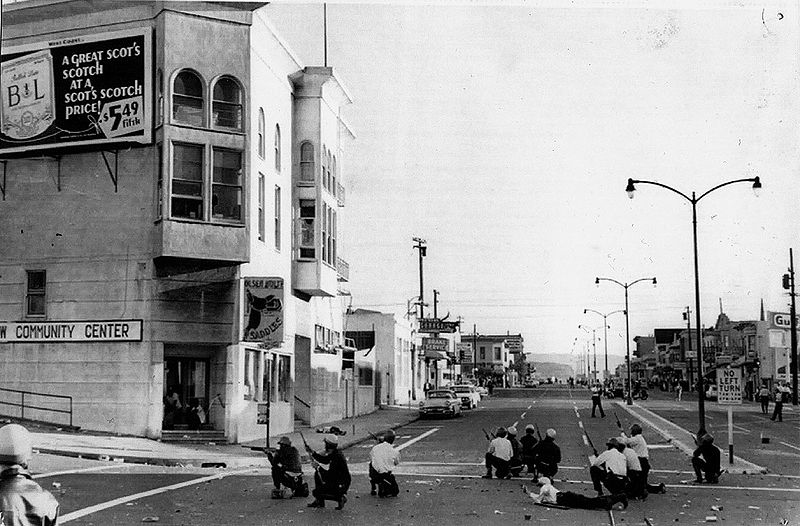 Although the young “rioters” did little damage beyond breaking some windows and overturning a police car, Mayor Jack Shelley sent SFPD sharpshooters, who shot into the Bayview Opera House, where children had sought sanctuary. And Gov. Pat Brown, father of current Gov. 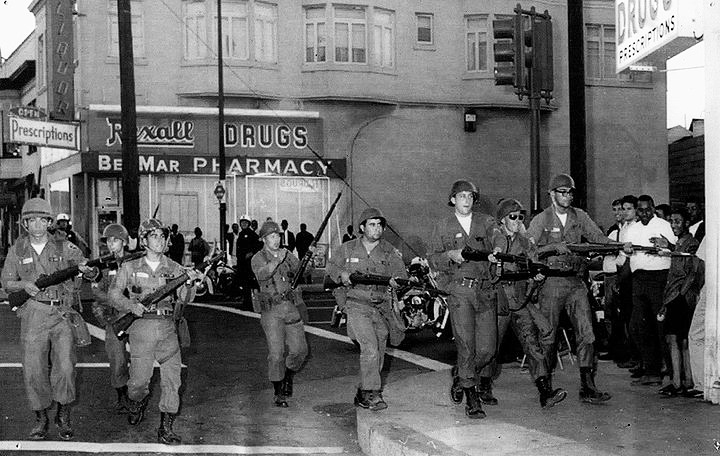 Jerry Brown, declared martial law and called in the National Guard, who patrolled Third Street on foot and in tanks. The repression left scars that make it hard for people who lived through the rebellion to talk about it 45 years later. The Bay View encourages those who remember to share your story so that what should be a proud chapter in Black history of defying injustice is never forgotten. “Our Part of Town,” a play performed in 1994 at the Bayview Opera House, recalled the 1966 “riots” in Hunters Point. Clippings in a book compiled to accompany the play relate that “after the 1966 Hunters Point riot,” the federal government granted $150 million, which, under community control, built 3,000 new homes on Hunters Point Hill, many using local Black contractors and workers, and transformed Butchertown into the India Basin Industrial Park, creating 4,000 jobs. The description of the rebellion from the play’s script follows. The play, including stories told by several Bayview Hunters Point elders and skits performed by youth, was presented on two nights. This segment by Harold Brooks was considered too provocative and was omitted from the second performance. Narrator: Now let’s go back in time to 1966 when the men and women of Bayview Hunters Point pulled together. It was a struggle to get Bayview Hunters Point to be what it is today, and here to tell you the story, we are proud to introduce one of Bayview Hunters Point’s community activists, Mr. Harold Brooks. Harold Brooks: I am here tonight to describe the Bayview Hunters Point riots and some of the other events that happened in our part of town. 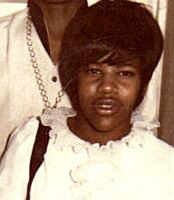 On Sept. 26, 1966, the police shot Matthew “Peanuts” Johnson on Griffith Street. The police thought the boy had stolen a car. Peanuts, seeing the police coming after him, became frightened and started running. The police shot him in the back as he fled. The unfortunate event began what is known as the Bayview riots. The first night, Third Street from Palou to Fairfax was like a “war zone.” Community youth began throwing bricks, breaking out windows in the businesses and street lights along Third. Mayor John Shelley and Chief of Police Cahill met with community spokesmen James Richards and Gene Maybrea to attempt to peacefully resolve the dispute. During this meeting, a call was received saying that National Guard tanks were rolling down Third Street and that police, in full riot gear, were lined up in flanks, some kneeling, others standing behind, with rifles trained on the Opera House from the west side of Third. 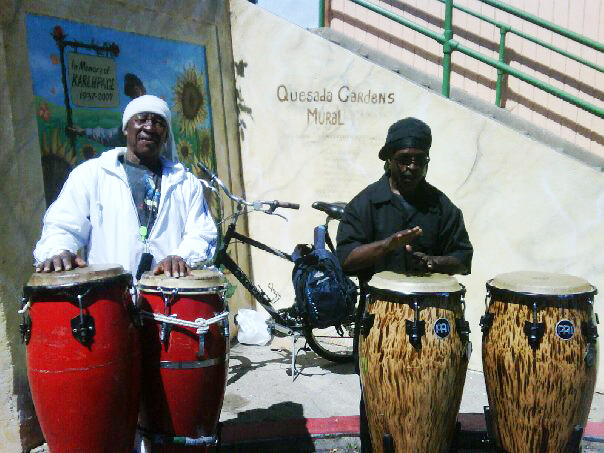 At that time, the Neighborhood Community Center was here in the Bayview Opera House. The Opera House at the time was loaded with young people and children, with only a few adults. The police claimed that they had been fired upon, which caused them to shoot up the Opera House. It was a nightmare. Many of our youth were wounded, though no one was killed. Youth leadership, including James Richards, Gene Maybrea and myself, negotiated an agreement to stop the riot to avoid further injury and property damage in the community. The compromise that was reached kept the police west of Third Street and the youth patrol working with community residents to monitor and maintain safe conditions east of Third. This began the organization known as Young Men for Action. Young Men for Action went on to demand many other benefits which ripple through the community today as a result of this riot. These include job training, job opportunities and educational benefits. 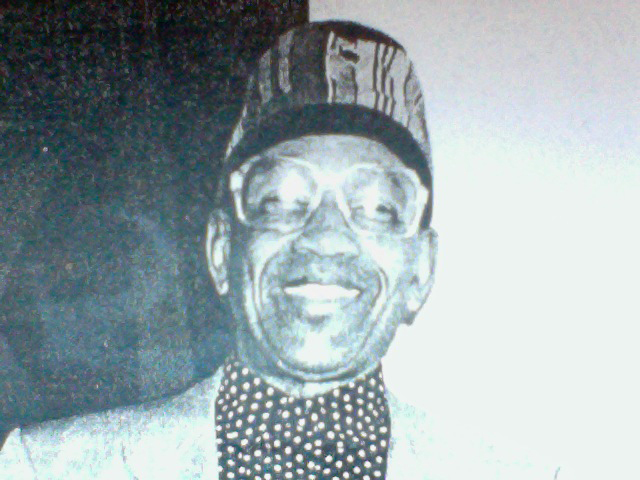 Harold Brooks headed the Bayview Hunters Point Model Cities program. This segment from the play, “Our Part of Town,” first appeared in the Sept. 16, 1994, Bay View. During the 1960s there were riots in some cities. The carryover here was, they called it a riot out at Hunters Point. A policeman had shot a 17-year-old kid who had stolen a car. He was out joyriding like a lot of other 17-year-old teenagers do. They steal somebody’s car and cops were pursuing the car. When the kid got out there in that part of Hunters Point where it happened, he jumped out of the car and ran across a vacant lot. The cops told him to halt and of course he didn’t pay any attention to that. That’s what started the shooting. The teenagers started saying it wasn’t fair for that boy to be shot like that and they started gathering out there on the streets, and that’s when we first started hearing about it, because somebody out there was calling Nat, they were calling the NAACP to let them know what was going on. There was more policemen on the street out there at that time. The kids would be away from the cops and they’d throw rocks at them. And as the day progressed, it got worse. I remember when that thing occurred. It was coming over the news on the radio. We’d heard about it out here. Burbridge was still president of the NAACP. He came by the paper because we were right over here on Turk Street then and asked me if I would like to go out there with him. I said sure, I’d like to go. So we went and there were a lot of angry young Black males out there. They were demanding to see the mayor. Jack Shelley was mayor then. So before we left them out there, Nat Burbridge called the Mayor’s Office and said he thought it would be good for the mayor to come out there and talk to those kids because most of them were teenagers. He refused. We came to that police station on Third Street; it was called Potrero Station. We walked in there. Jack Shelley was in there. Tom Cahill, who was chief of police was in there. It looked like everybody was in there. Well, when we got to the police station we saw a car overturned, burning out there on Third Street. They smashed out a lot of windows out there along Third Street. And it looked like there was another fire further out, and they were still out there throwing rocks. Well, the police were trying to halt it, but it looked like they weren’t doing very well. So the mayor decided that he would go over there and address them. They went over to that old Opera House out there on Third Street. That’s where the kids were all gathered over there. All of us who were in the police station went over there. When we walked in, they started yelling, cursing the mayor. When he got up on the stage, they started throwing eggs at him and vegetables (chuckle), and he couldn’t make a speech, so the mayor ducked out. Well, we knew it was going to be even rougher later on. So we came back over to the police station and we heard that Pat Brown – he was governor then – was going to come down from Sacramento and go meet with the mayor and everybody else at the Hall of Justice. We went over to the Hall of Justice and the governor came in and that’s when he decided to call out the National Guard. I told Nat, “It looks like we’re going to be up all night.” Because most of these Guardsmen are 19-, 18-year-old kids, and they’re scared. I said, “They’ll shoot!” I said I think we ought to start patrolling the streets. So we went further out on Third Street trying to tell them, “The National Guard are coming out here. If they tell you to get off the streets, get off the streets.” We went out to Sunnydale and did the same because they were all out there on the streets. And we went along Fillmore Street and it wasn’t long after that we saw these jeeps patrolling around with a machine gun mounted on the back! We knew that they meant business. So we stayed up until about 4 o’clock in the morning before we went home. I don’t think he declared martial law, but he called out the National Guard to restore order. I think the Guard was pulled out after three days. Thomas Fleming, 91, editor of the Sun-Reporter in San Francisco 1944-1994, was interviewed on Jan. 9, 1999, at his home on Fillmore Street in San Francisco by Chris Carlsson, with assistance from Caitlin Manning, Joe Caffentzis and Max Millard. This interview has been posted at FoundSF, an excellent source of history.